Yesterday I came across this church that played Elvis gospel songs as part of their worship, and I enjoyed it so much. I found myself worshiping the Lord. This church is in Amsterdam, and they speak Dutch, but the singing is in English. I really loved the way the choir sings with Elvis. It was such a blessing to me. In fact, even Elvis sounded better with the choir backing him! I loved the way the choir swayed to the music. The audience was fantastic too. I confess, I skipped through most of the talking parts, but I loved the singing. I really enjoyed that last song, and it looked like the people were almost dancing out of the church. I got such a charge out of that. In fact I felt quite sad that the church service was over. This is Jay Zanier singing at a church in Mississauga. O Happy Day, He touched me, Walk them golden stairs, How great Thou art, Where no one stands alone. These guys sing really well. They are top notch singers and performers. They are better than I have ever been. The lead singers are: Jay Zanier, Dwight Icenhower, Mark Anthony, James Gibb and Di Leichtweis. The band and back up singers are very good too. Excellent show! Some of those slow gospel songs were sung with so much feeling. We heard Leland about 20 years ago in a church, and really loved his performance. In fact we bought a few of his tapes, and I have had his poster on my bedroom wall all this time. I think he lives near Calgary. This gentleman sings real good, and has recordings available for purchase. He is also from Canada. This is part of the Memphis contest. I think this is one of the best worship songs ever. This gentleman is also from Canada, and runs his own church, where he sings Elvis gospel songs. This man sings so nice, that I have done a separate section on him. 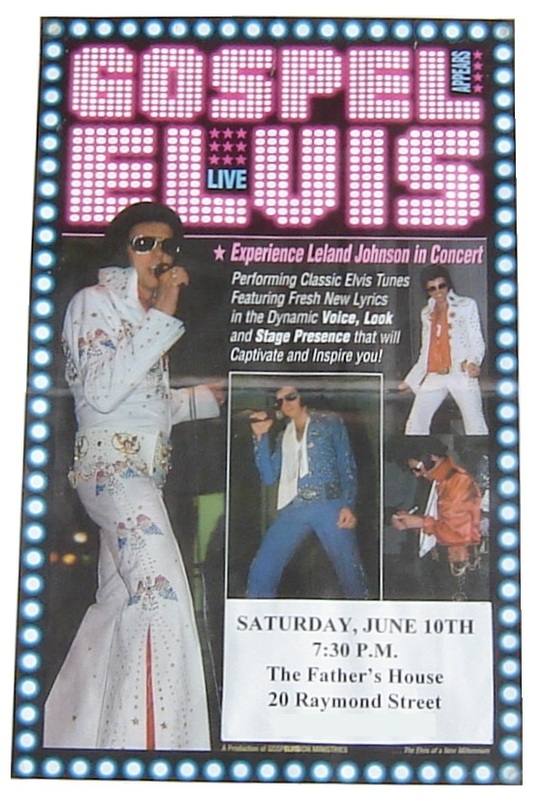 There are lots of other Elvis gospel tribute artists that I have links to, but I will add them at a later date.